How to get a donated dog wheelchair for your paraplegic pet is a question many pet owners ask themselves. That’s because they quickly learn a dog wheelchair is the one device that can have the greatest impact on their pet’s quality of life. Wheels give paralyzed dogs the freedom to walk and run like a normal dog. It is the gift every pet parent hopes to give their disabled dog, but for many the price tag of a new cart is out of reach. Wheelchairs can cost $350 for a small rear support cart to more than $600 for a full support quad unit. It is frustrating for owners who desperately want to help their dog, but cannot afford to do so. The problem led me to do some research and I was surprised to find lots of great resources. This post will direct you to the groups that show owners how to get a donated/ free dog wheelchair. There are wonderful organizations and individuals that are ready to help you with free carts, donated wheelchairs and loaners. I have written about some of them before on their individual merits, but the time has come to put all of these groups together in one comprehensive list. Why dog wheelchairs are expensive. Dog wheelchairs are complicated and a lot of custom work goes into building each new cart. The leading U.S. manufacturers take pride in using durable, but lightweight materials that won’t strain a paralyzed dog’s back. In addition, the majority custom design each cart to meet the physical needs of individual pets. While this attention to detail is admirable, it also drives up the price. The groups who offer free donated dog wheelchairs, for the most part, are made up of animal lovers who have or once had a paralyzed dog in their life. They understand the obstacles and took it upon themselves to help others. Each group exists because of the generosity from the public. Red Flyer, The Handicapped Pets Community – This amazing organization is run by one dedicated man named Harlan Weikle. Red Flyer accepts used wheelchair donations, refurbishes them and loans them at no charge to families of handicapped pets in need. Their motto is, “No pet should be alone or without the gift of mobility.” Red Flyer works on the idea that recipients return the cart when their pet no longer needs it. To date they have loaned more than 230 carts. Application instructions can be found in the About tab on the Red Flyer Facebook Page. Gunnar’s Wheels – Gunnar was a treasured pet who was struck by a truck in 2014. When his owners, Jason and Stephanie Parker, were hit with the cost of Gunnar’s veterinary bills and the price of a dog wheelchair, they started a GoFundMe page to help pay the expenses. The Parker’s were surprised by the generous outpouring of donations they received. When Gunnar was back on his feet, the couple decided to start another GoFundMe page to buy wheelchairs for other handicapped dogs in need. During its first year, Gunnar’s Wheels handed out 40 carts to paraplegic dogs. Every year since, the organization has supplied carts for dogs around the world. Applications can be made on Gunnar’s Wheels GoFundMe Page. Hailey’s Wheels for Life – This special nonprofit group is based in South Australia, but they grant wheelchairs around the world to individuals and rescue groups. Their vision is, “To encourage an alternative to euthanasia and to prolong the life of an otherwise healthy dog.” Hailey’s Wheels works with Walkin’ Wheels adjustable dog carts. The group is named in honor of a little Westie named Hailey who became paralyzed at the age of 12. Hailey contracted a parasitic disease of the spinal column called Neosporosis. She was a feisty pup who continued to enjoy life with her family until she lost her battle with the disease. Pet parents can apply for a subsidized wheelchair here: Hailey’s Wheels for Life. Joey’s P.A.W. (Prosthetics and Wheels) – Joey is a dog whose rear legs were intentionally amputated when he was 6 weeks old. His adopted family decided to help other handicapped dogs in need. Joey’s P.A.W. is the only organization that donates funds for custom prosthetics for dogs with amputation and dog wheelchairs for disabled pups. Pet families can apply for assistance by leaving detailed information on Joey’s P.A.W. Contact Us page. Applicants hear back in 24 hours. Click here to read about Joey’s P.A.W. Wheeling Superheroes – Inspired by her wheelchair bound dog, Pugly, who was an Instagram star, the founder of this nonprofit decided to give back to other paralyzed dogs. Wheeling Superheroes raises funds to buy brand new dog wheelchairs for pet families who can’t afford one for their canine. Applications need to be completed on the Wheeling Superheroes website. In addition, families are asked to send a letter from their veterinarian about how their dog will benefit from a cart. Rescued Rollers – The goal of this organization is to supply low-cost pet wheelchairs to individuals who could otherwise not afford them. They donate carts to rescue groups as well. The program works with all of the major manufacturers to get new carts or refurbished wheelchairs to financially stressed families with paralyzed dogs. Many of their carts are donated by private owners who no longer need them. Rescued Rollers gets each gently used wheelchair back into tip-top condition so it can be donated to a pet family in need. Rescued Rollers also educates the public about life with a handicapped pet. Owners can request a cart from this 501c3 charity by completing an online application. Rescued Rollers Application. Mango on a Mission – Mango is an adorable Cairn terrier who was found on the side of a road with a broken back. The paralyzed pup won the heart of disabled Army veteran Judy Walter when she read how Mango became the first handicapped dog in a program that visited veterans in the hospital. Judy adopted Mango and started a Facebook page to mark her accomplishments. One of Mango’s followers contacted Judy about getting a wheelchair for her own paralyzed dog. Judy asked her followers for help and before she knew it there was enough money for several carts. The informal program has continued to grow. Mango on a Mission purchases new carts from Ruff Rollin Dog Wheelchairs. There is an application available at the bottom of their website: Mango’s Freedom Wheels. Or contact Judy on the Mango on a Mission Facebook page. CorgiAid Cart Program– This nonprofit organization specializes in helping Corgis and Corgi mixes. They started their cart program because Corgi’s are one of the breeds prone to developing Degenerative Myelopathy. Their supply of dog wheelchairs is loaned to dogs in need. Pet owners must agree to return the cart, at their own expense, when their Corgi no longer needs it. There is also a refundable $50 deposit required and $35 in shipping charges. Applications can be completed at: CorgiAid. Did you know the majority of dog wheelchair manufacturers have programs for pets in need? Most are unofficial programs where the company hears about a special case and donates a cart to the pet. And other programs exist, but are not advertised unless a pet owner asks. In addition, there are two manufacturers that have rent-to-own programs. K9 Carts and Handicapped Pets each offer this type of plan to make it easier to afford a cart. Handicapped Pet Foundation – HandicappedPets.com started a nonprofit corporation that donates carts to pets in need. The Foundation is dedicated to extending the life of paralyzed pets and making sure they have the exercise and mobility they need for a happy and long life. Applications can be completed at: Handicapped Pet Foundation. Eddie’s Wheels Donation Program – This is an unofficial program that Eddie’s Wheels is happy to explain. When people donate a cart back to them, Eddie’s Wheels holds onto the wheelchair for dogs in financial need. If you contact them be prepared to take specific measurements of your dog. Eddie’s Wheels will then do their best to match your pet’s needs to a cart in their inventory. The people at Eddie’s Wheels are perfectionists so they won’t release a cart unless it will work seamlessly for your dog’s height, weight and medical condition. That might mean waiting for the right cart to become available. Eddie’s Wheels will then refurbish the wheelchair for a nominal fee and donate it the family, rescue group and even veterinary practices. Owners are also asked to pay for shipping. If you have another resource that knows how to get a donated dog wheelchair for your paraplegic pet, please leave it the comment section. I will be happy to add to this list. I would also love to hear if you apply and receive a cart from one of the amazing organizations listed in this story. 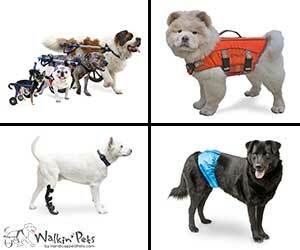 Walkin’ Pets has a wide variety of gear for paraplegic pets. Thank you for researching and sharing the information. Your time doing so, is greatly appreciated. Many years ago when I needed a k9 cart for my German Shepherd, but didn’t have the financial means, I was determined to find a way. So I came up with this idea to have a yard sale. I spread the reason for the yard sale to everyone I knew. Kindly requesting if they had anything to donate for the yard sale, with all proceeds going towards a k9 cart. I was able to purchase a “like new” k9 cart, and thank goodness, it gave quality of life to my best friend. Sophie was blessed to have you as her family. And I’m sure, you were blessed in many ways to have shared Sophie”s company. Dogs are truly angels in our lives. Victoria, Your German shepherd was lucky to have you too. I hope this article will get lots of dogs into carts. Wordy yes, but you read it! John C Hughes, may you find some peace and love in your life rather than spending precious time on this Earth sending trivial and negative comments to an amazing woman who is spreading love and kindness to animals and humans alike. PetRescueMomma, Thank you for all that you do, you are absolutely incredible. Much love to you for your kind and warm heart! Melodie, Thank you for the kind words. Thank you so much for this resource. My five year old beagle was recently paralyzed in the back legs after a ruptured disk. Regardless of an extensive and expensive surgery he’s unable to use his legs. More were left with a large veterinarian bill and a need for a wheelchair. This information will definitely help me on my search. Chelsey, I am sorry to hear about your Beagle. I hope you find a wheelchair that fits your budget. i have an 8 yr old female pug. she is losing control of her back legs however i’m on disabilty and cannot afford a wheelchair for her. any ideas? The post where you left your comment lists lots of organizations who get wheelchairs for dogs when their owners cannot afford one. If you find an organization you like, click on the name and the link should take directly to their site. Best wishes. This is exactly what my german shepherd needs! any advice or help would be greatly appreciated! I just want to be able to take her for walks again. She loves walks and lately hasn’t been able to do a lot of the simple things or things she loves because of her hip and leg issues. The surgeries and wheelchairs are expensive along with her other vet bills. I’ve been trying to save a lot for it but am struggling, any information would be great! Megan, I hope one of the organizations can help you with a dog wheelchair. Did you receive a wheelchair? My dog is paralyzed I need wheel chair please help. He is medium size dog. I cant find in my country. Mohamed, I’m sorry to hear about your dog. My website does not donated wheelchairs, but you will find links in the article that will direct you to groups that can help. I also suggest you go to YouTube and type in DIY dog wheelchair. You will find lots of videos that give instructions on how to build an inexpensive wheelchair. Best wishes. Hi, my dog was hit by a car and shattered his back right leg. He had to get it amputated, the whole leg was amputated. He’s having trouble walking for a long period of time without sitting, and he’s in pain with his back. He’s a black lab that weighs 80 to 85lbs. A cart would do him a world of good, and we’re not able to buy one. If there’s anything you can do for him, we would greatly appreciate it. Thank you. Deborah, I am sorry to hear about your dog. My best suggestion to you is to contact the organizations listed in my post, How To Get A Donated Dog Wheelchair… and apply for one of their donated or loaner carts. In the meantime, you might also want to look at a lifting harness from WalkAbout Harnesses, GingerLead, or Walkin’Pets. Do these carts also help dogs that require back legs amputated? Or are they only for dogs that still have one or both back legs? Linda, I’m sorry to hear about your brother’s dog. If you read this article you’ll find links to the organizations that can help with a cart. In the meantime, please check into a support harness for the dog. They are inexpensive and will help your brother lift and move the dog without hurting himself or the dog. I like the support harnesses at handicappedpets.com. Has Sheba been seen by a veterinarian? If her hip is broken, she might require surgery. A dog wheelchair is a wonderful device, but it is only intended to be used for exercise. Dogs cannot lie down in them. Please check with a veterinarian about her condition. My dog is 15 year old English Sprinter Spaniel and her back 2 legs are starting to give out on her. Looking for a free wheelchair for 50 pound dog. 14 inch measurement of her back two legs floor to hip / belly. Jamie, Thank you for reaching out about your dog. The story I wrote about How to get a donated dog wheelchair lists many nonprofit organizations that can help you. The article also explains how to apply to each. Please click on the story to read the information. I found this information helpful-we did apply for some help-I understand we may not qualify r/t our income, but when something like this happens it is a cost no one is prepared for, and it is an ongoing cost-so we are hoping to get some type of help from these resources. Our pup just recently has become paralyzed, we know we need wheels for her, possible a larger doggie door so she can continue to get in/out with our pups and a ramp so she can get to the yard. Concerned pet owner, You are right that no one is prepared for their dog to become disabled and the costs that go with caring for them. I hope you’ll contact one of the organizations listed in this article for help. I have a 12 year old GSD whose health is fine but has hip dysplasia and arthritis. I am desperate to prolong his life but have been unemployed for 8 months and cannot afford a wheelchair. Any help would be greatly appreciated. Kim, I’m sorry to hear about your dog. The story How To Get A Donated Dog Wheelchair lists the nonprofit organizations that help pet owners. Take a second look at the story and click on the name on each organization. It will take you directly to their website or Facebook page where you can apply for help. That said, you might also want to check out a rear support harness for your GSD. You can find them on Walkabout Harnesses. I blame myself. Our daughter and family had some functions to attend to we allowed them to bring their standard poodle puppy along. Jon, I am so sorry about what happened to your dog. Please don’t blame yourself. It was an accident. The good news is your min pin is alive. She can have a happy life with you and your wife. It just takes a little practice and a few items to help her adjust. Most are not expensive. Please check out the FAQ page on my website and I bet you’ll see answers to your questions. You wrote your comment after reading about donated carts. There are many organizations to help with the cost, but actually a cart for a small dog like yours isn’t very expensive. A good place to start is Handicappedpets.com. Or apply for a cart with one of the groups in the story. The other things you need remember are to not let your dog lie on one side for too long. If she can’t flip herself over, gently help her to prevent pressure sores. If she is unable to scoot, a towel can be used as a sling to move her. And if she is incontinent, the best thing you can do is learn how to express her bladder. Your vet can help with this. There are lots of pet owners with disabled animals. It’s not bad, it is just a new normal way of life. Please don’t beat yourself up. Your dog is alive and loves you. Best wishes. Have Alaskan malamute with hip dysplasia or stroke in his spine cord .He need a wheelchair for his back legs.He on medication but not standing up,but sometimes sit on his back legs for a short time lay back down. Vivan, The organizations listed in this article are all ready to help owners whose dogs are in need of a wheelchair. There is information about how to get in touch with each of them. I hope you get your dog up and moving again soon. Hello out there I took my pugle to the vet he tells me everything ok two days, later my dog is paralyzed.and after paying 750.00 I payed again and another vet same place in cerritos ca he tell me I have to take him to a nuerologist . I need assistant. Mary, I’m sorry to hear about your dog. It’s too bad the veterinarians didn’t send you directly to a veterinary neurologist. While it is expensive, the best way for your dog to get an accurate diagnosis is through an exam with a neurologist. Have your asked what the fee will be for an exam? Most veterinary neurology practices offer a payment plan or work with a Credit Care which is a lending company for veterinary care. If this isn’t feasible, here is a link to a story about Organizations that help pay for veterinary treatment. https://lessonsfromaparalyzeddog.com/when-pet-owners-cant-afford-veterinary-bills/ Each has their own requirements so please read through the story thoroughly. Another option is to start a GoFundMe page for your dog. I hope you get to the bottom of your dog’s problem. Wendy, I’m glad you found the story helpful. Please let me know if any of the groups were able to help your dog. Were you able to receive a wheelchair? Denise, are you trying to get a donated cart for your dog? If so, I am happy to direct you to the most active groups. PetRescueMomma – Thank you SO much for this information! Our beloved boxer Logan had Degenerative Myelopathy, and we were blessed to be able to afford a wheelchair and work from home so we could care for him and have him with us for another year. Now that he is gone, we would like to donate the wheelchair so that another family will be able to use it, but I did not know where to start. I will be contacting these organizations and I’m sure one of them will be able to help. Tammi, I’m sorry to hear about your dog. The donation of Logan’s cart to one of these organizations is a wonderful way honor to his memory. Please send me a follow up. I’d love to know which group you chose. Best wishes. Does the dog wheelchair work on stairs? My 75 lb boxer has a problem with her back legs. Slips slides can barely walk. I live on the top floor I help her down the stairs and practically have to carry her up. When she goes out to do her business does the wheelchair have to be removed? Please email me asap. They want to put her down and honestly they may just as well put me down with her. Marie, Thanks for reaching out about your dog. A wheelchair is not a good choice for going up and down stairs. It should be used to walk and exercise your dog. What will help is a support harness. I’m including a link to a story about my favorite harnesses, but what the article does best is describe the purpose of each type of harness. If your dog still walks and needs light support, check out the harnesses from GingerLead. The article will give you links to each company. You might also want to consider boots to keep your dog from slipping. Walkabout Harness has two types that I like. I hope this information helps. Please also check out the FAQ page on the website. It will answer many of your questions about life with a disabled dog. You didn’t mention your dog’s age or diagnosis, but if she isn’t in pain and engaged in life, you should know that many dogs lead quality lives even with mobility problems. Kymberli, I’m sorry to hear about the loss of your dog. It’s very generous of you to want to donate her cart. There are a lot of great organizations who either loan carts or donate them to pet families in need. You can find them in my article: https://lessonsfromaparalyzeddog.com/how-to-get-a-donated-dog-wheelchair-for-your-paraplegic-pet/ Or you might want to reach out to Gunnar’s Wheels via their Facebook page. The founder Jason works with all of the groups so they can get wheelchairs to as many dogs as possible. You can leave a message for him: https://www.facebook.com/Gunnars-wheels-1155089164561706/ And if you’re not on Facebook you can email Jason via the Gunnar’s Wheels GoFundMe page: https://www.gofundme.com/2z89y8hs Thank you for your generosity. Thank you. I’l reach out to Gunnar’s Wheels… I follow them on Facebook. I live in India. I have adopted a pup who was,to be euthanised due to an accident which had paralysed his back legs.he was about 2 months. Got him home frm our animal shelter. After checking out on this website ,learnt to deal with his problem.later got aurvedic meds and with massages etc got him moving on his front legs. Now he has a lot of movement but his hind legs are turned up. Use baby diapers, .split it and tie edges around his abdomen. Found this most convenient after trying diff methods.now he is grown up .a yr now.got him a cute pup who is also a yr old now .they have a great time together along with 2 kittens too.all frm shelter..learnt to express his bladder . All r toilet trained.now he goes into the toilet too. Its been a great experience frm carrying him to relieve himself to the present.thanks fr sharing all ur experiences.i learnt a lot frm them. Vijan, Thank you so very much for sharing your story. You are a hero for saving the dog when he was to be euthanized. I hope he’s with you for a very long time. Your pup is lucky to have you. Best wishes to you both and your new puppy. Hi There: I adopted a special needs very tiny chihuahua who was officially diagnosed with Atlantoaxial Luxation and is unable to walk. Been working with a neurologist vet who has him in a splint. At first it really helped but now he is deteriorating. Our guy is less than 2 lbs and not expected to be much bigger. I purchased a mobility harness but it is not appropriate for his condition. While the wheelchair idea sounds interesting our guy just isn’t strong or big enough. It is hard for me to see him having the ability to move anything heavier than a few ounces. Anyone have experience with wheelchairs used for this small of a dog? I was also looking for a remote control electric car as an option. I have seen some that have seats but was looking for something with more of a bed. Anyone know if resources for something like this? Thanks so much! I’m sorry to hear about your Chihuahua. You might want to contact Walkin’ Pets handicappedpets.com They have a Mini dog wheelchair for toy breeds. Their website says it’s for dogs 2lb – 10lbs. Here’s the link: https://www.handicappedpets.com/dog-wheelchair-mini-adjustable-wheelchairs-for-dogs-with-disabilities/ You might also want to contact Eddie’s Wheels to discuss a custom made cart. I’ve also seen carts made from everything from legos to a child’s toy car. Hopefully, you’ll find a mobility device to help your pup. Need a wheelchair for our beloved Beaux. We have been trying to get him one.Can’t afford one.Nobody.wants to return our messages at other sites.Please help.Beaux is a 90 lb..Great Pyramees/ Golden Retriever. He’s only 6 yrs.old,super sweet and a real social butterfly.Even was admitted into the Portland Oregon zoo.He had a Fibrocartilaginous Embolism, right before Christmas. He was going to be put down, but we wanted to try our best, to save him.He wasn’t eating or drinking and tried to hide,probably,to die.His breathing was erratic and his strength was gone.After days at the Vet’s, IV’s and 5 different medications, he pulled through.Now went need to rehabilitate him.My hubby is trying to lift him,but he is handicapped. I can’t lift Beaux..A wheelchair would really help.The bill was high,and we can’t even pay,to rent one.Please help. Dogs with FCE strokes have a good chance of recovering. Physical therapy rehab and Hyperbaric Oxygen Therapy work wonders for this condition. Please check with your vet about both. MJ & Lee do you still need a wheelchair? If so, please see my other comment. Denise, If you haven’t heard back from Lee & MJ about your dog wheelchair, I encourage you to post a free ad on our website. You’ll find the details on the home page. Thank you so much for this post!! I’ve reached out to eight of them and am hoping for the absolute best. This has been an absolute miracle of information. Mishka, Please let me know what happens and if one of the groups is able to help you. Thanks so much for the info!! My sweet beautiful German Shepherd is just starting with neurodegenerative disease. I’m am heartbroken as he is perfectly healthy incsll other ways and only 8yrs old!!! He is still able to walk but I want to be prepared. He has already lost control of bladder and has some knuckling in one leg. I’m so glad to hear there are alternatives to euthanasia. Having just had to euthanize my 18yr old Beagle, I can’t bare to think of experiencing that again with my German Shepherd so soon!!! Jn, I’m sorry to hear about your dog. In addition to a cart, please talk with your vet about starting your dog on water therapy and physical therapy. Both have proven to be beneficial to dogs with DM. Thank you for posting this info. I have been rescuing dogs (10 total + a calf & we also had set of triplet ewes) since moving to the country in 2005. Since we have some land & pastures about us people just abandon animals here. I am down to 6 dogs now.Every year since 2013 one of our fur babies has passed on, only 1 passed in his sleep, the rest had rough times including my lambs whom a neighbors dog slaughtered, severely injured my cow & all passd. My vet is on speed dial & a heavens sent, he & I are now doing everything possible for my Max. While taking care of my daught-in-law & son’s year old Pit bull/boxer, ( who is super hyper) ( while she is on deployment & my son is severely ill,) plowed over my Max, medium size mostly chow breed. Max will be 14 come July. His back end got twisted before hitting the ground last week. He now has tremors & his hind legs are paralyzed. His front half wants to get up & go but he can’t get the back end up at all now. Vet started prednisone today & lots of prayers it helps. Max has a beautiful disposition, eats good still & drinks, a little slow on cognitive level but still alert. I also give him some CBD oil to help. I’m on SS, things are tight but these guys need me so they come first. Cost for wheels for my Max is out of reach but I will & need to help him, he is not ready to give up. I have another son who helps me with him to carry him to go potty, I have rheumatoid & fibromyalgia so Max is too heavy for me to lift. Hoping wheels will give him the extended quality of life he is still trying to keep. And if your dog hasn’t been examined by a neurologist, you might want to reach out to Bialy’s Wellness Foundation for financial help in this area as well. You have more than your share of stress, but it sounds like you have a great attitude. Thank you for helping so many abused animals. Hi, I live in Cape Town South Africa and our beautiful dapple daschund was fine until the morning of the 14th of Feb 2019. I already went for a second opinion but it all comes down to IVDD. The surgery and MRI is so expensive but we are going to treat him conservatively for now, pain medication, rest and a weekly injection (for 4 weeks) to strengthen the joints and disc (T13 specifically) reduce swelling and inflammation again. Between crying and utter despair I am trying to come to terms that he might never walk again and considering getting a wheelchair if he doesn’t improve within the next 4 weeks. I have looked on several websites but can’t find someone in South Africa specializing in this. I guess I just want some advice on how to cope with this and how to make his life easier since putting him to sleep is not an option for me, he is only 5 years old. Sonnette, I’m sorry to hear about your dog. You should know that many veterinarians encourage a conservative approach to treating IVDD. Please check out a website called Dodgerslist. You’ll find all the information you need about the conservative approach. In the meantime, I’ll give you some articles we have about: crate rest, rehab exercises you can do at home, and more. And regarding a dog wheelchair, there are also inexpensive ways to transport your dog. Please check out our FAQ page, but here are links to articles that may help: https://lessonsfromaparalyzeddog.com/steps-to-take-when-your-dog-is-confined-to-crate-rest/ https://lessonsfromaparalyzeddog.com/6-rehab-exercises-your-handicapped-dog-can-do-at-home/ https://lessonsfromaparalyzeddog.com/taking-the-mystery-out-of-doggie-diapers/ https://lessonsfromaparalyzeddog.com/cost-saving-mobility-carts-for-big-paralyzed-dogs/ You’ll also want to make a lifting harness. You can use a large towel or cut a canvas bag. There are many ways to help your dog without going over your budget. Please let me know if you have more questions. Good luck to you and your pup. Sangeeta, This story has links to each charity that helps get dog wheelchairs to pets in need. When you click on each one it will take you to their application page to apply for a cart. Best wishes. Thanks for what you are doing for handicapped dogs. I know this is a site for dogs, but I rescue kittens. I recently received a spunky little 8 week old kitten who has partial paralysis to his hind legs. I have seen a vet about it. He advised me to possibly find/ make a cart for him. Do you know if a dog cart will work on a cat? Can you please help me get one? Thank you. Renee, Thank you for rescuing the kitten. The answer to your question about cats doing well in a wheelchair is – absolutely YES! So if that’s the advice of your vet, please move forward on getting this kitten some wheels. All of the major dog wheelchair companies make carts to fit a cat. I suggest you talk with Eddie’s Wheels or K9 Carts. Each of them make great custom carts. And another option is to contact Walkin Wheels from Handicappedpets.com. Their wheelchairs are adjustable and can be made larger as the kitten grows. All of these companies give discounts to rescue groups. A cart for a small animal won’t be too expensive. I wrote here awhile back & a woman Both got back to me. After a few emails she told me the guy Jason was to give me a quote which now has been quite awhile an never heard from. I asked several times whereabouts on their “list” would my dog Max be so I would know what measures I needed to go forward with for him. She never answered me. So what kind of site is this Gunnar’s Wheels, how long is one to wait for a reply? My Max in s important, he is family, & he has needs right now. I understand there’s probably many out there in the same shape but at least gave the decency or courtesy to respond to let people know where they stand. Donna, I’m sorry you ran into this problem. Jason at Gunnar’s Wheels is very dedicated to helping pet families in need and everything he does to get paralyzed dogs into carts is as a volunteer. I can only assume that your information got misplaced somehow. You might want to reach out to Gunnar’s Wheels again or you can contact any of the other charities listed in the How To Get A Donated Dog Wheelchair story. Links are provided in the post so you contact each group. That said, please know that a dog wheelchair isn’t the only way to keep your dog moving. Dogs only use their cart a few hours a day for exercise. You can get an inexpensive utility wagon at a store like Lowe’s or Home Depot to take Max on walks and give him fresh air. And you can turn a bath or beach towel into a sling to safely lift Max and help him outdoors to relieve himself. Here are links to the stories https://lessonsfromaparalyzeddog.com/how-a-towel-can-be-used-for-sling-walking-a-dog/ or https://lessonsfromaparalyzeddog.com/cost-saving-mobility-carts-for-big-paralyzed-dogs/ On a personal note, my dog didn’t like using a wheelchair so I put her in a child’s red wagon for walks and I used a support harness for lifting. There are lots of creative ways to keep your paralyze dog active and engaged in life. And if your vet approves, you can even start rehab exercises with him at home. Hope this is helpful to you. Best wishes. Your input was well accepted but the excuse for Gunnar’s Wheels is not. Beth was the person emailing me like 3 times, so if the info supposedly got misplaced then that’s on her & it’s not making for a very good reputable company or for any representative caring for animals. Unbelievable. I have checked messenger, which there are two that integrate together, checked my FB, checked phone messages, absolutely NOTHING FROM GUNNAR’S WHEEKS,JASON OR A BETH. I even checked their FB page where under Do you recommend Gunnar’s Wheels & I clicked NO,a page came up to say why & I wrote a whole scenario & after checking just now, other messages are there But mine is not. As before BETH told me she requested a quote for me from Jason & when he contacts her shell let me know the cost of a cart & I’m STILL waiting on that. I don’t know what their problem is, I don’t know these people, I took pictures an measurements ad asked of my Max provided copy of my social security an STILL nothing. So for Jason to state he’s waiting on info from me totally is not the truth. If they needed more if something then Beth should gave emailed again but I have nothing from any of them that’s why after week or so I wrote to you. Evidently Jason doesn’t or usnt able to contact people who do the actual request for a quote. After discussing with you he should have called me he has ALL my info yet he didn’t. Just a few moments ago Beth from Gunnar’s Wheels sends me a message, how ironic! I can’t do business with unreliable people like this or people who tell untruths to cover their you know what then hurry up & email a person to make up for their incompetence when caught in the act. My Max is being taken care of now by another company an who are working with my Max to care for all his needs. I told my vets previously that I had an app in for a donated set of wheels & if it didn’t come about I’d have them involved & as it is it has worked out ten times better in Max & my favor. As you can tell by now I would not recommend Gunnar’s Wheels if this is how they disregard customers & animals in need. When words are mixed an business becomes more important than the cause of caring, you have to walk away. My Max & all my other rescues are too important, I am their voices & their needs must be met when needed. I’m glad your vet is going to help Max get a wheelchair. I hope he had many years of joy running in his cart.